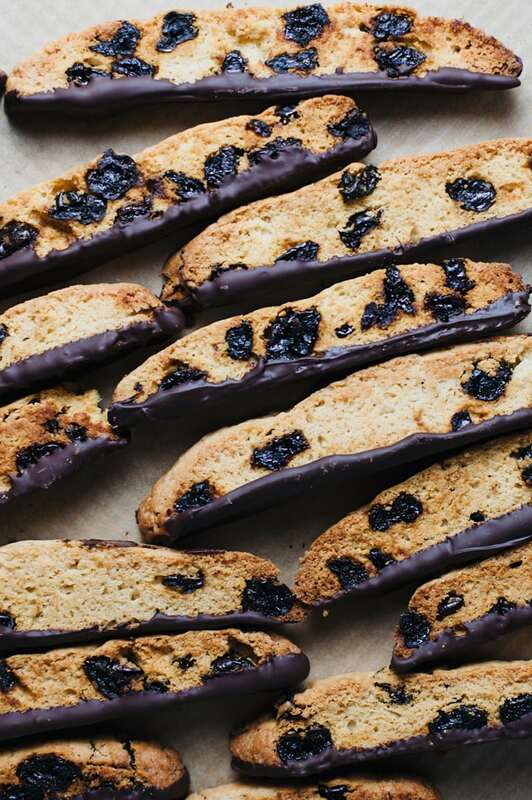 Delicious Italian Biscotti with dried cherries and dark chocolate. 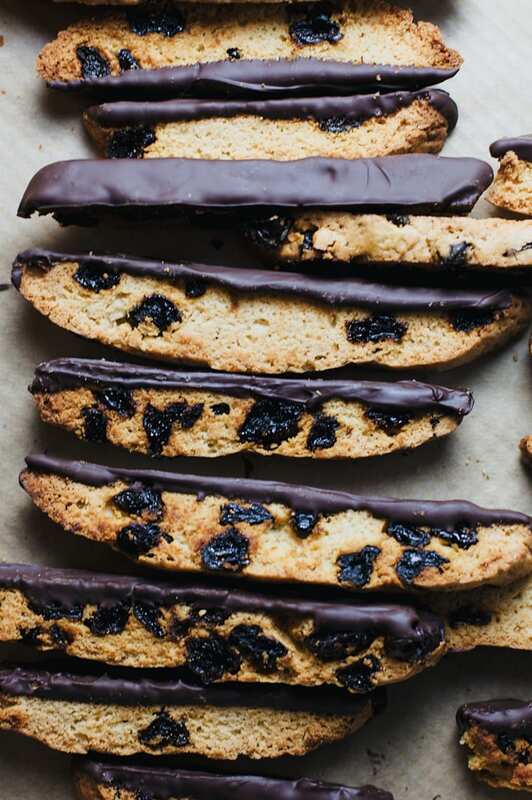 This recipe will turn you into a biscotti lover. 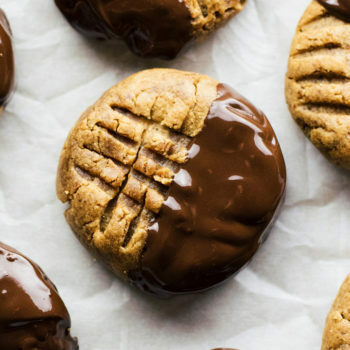 Irresistible cookies that are slightly crunchy, perfect for coffee dunking, and are so yummy! We are in the middle of baking season and it is quite exciting. If you haven’t had a biscotti or aren’t a fan – believe me when I say these will change your mind. 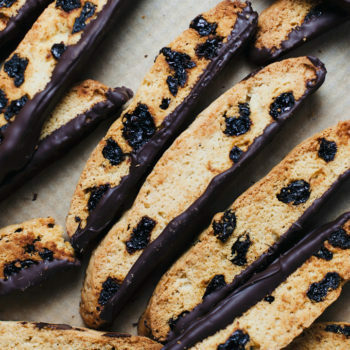 Delicious, crunchy biscotti’s with sweet cherries and then dipped in dark chocolate. I’m not much of a biscotti fan, but these are hard to resist – especially when it comes to coffee dunking. These don’t last more than 1-2 days in our house. Biscotti, known also as cantucci, are Italian almond biscuits that originated in the city of Prato. Biscotti means “twice baked” – first baked in a loaf, then sliced into their “biscotti” shape and baked a second time until slightly dried and crunchy. In a small bowl: stir flour, baking powder, sugar, and salt. 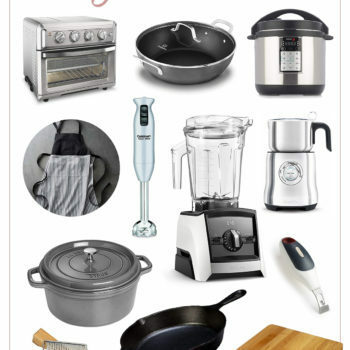 In an electric mixer or separate bowl: mix butter, vanilla, and eggs. Slowly add flour mixture into wet ingredients. Then, slowly stir in dried cherries. Lay dough out on parchment paper lined sheet pan – form into two 9 1/2″ x 2″ logs, about 3/4-inch tall. Use a wet rubber spatula to help shape logs. Bake for 25 minutes. Remove logs from oven and lower temperature to 325F. Let logs cool for 10 minutes, then carefully slice diagonally into biscotti shapes (about 1-inch thick). Lay biscotti on parchment paper lined sheet pan and bake for an additional 25 minutes until golden brown and crispy. As the biscotti pieces cool they will become more dry and crunchy. Cool completely before dipping bottom of the biscotti in melted chocolate. Lay on sheet pan with parchment paper and place in refrigerator for 15 minutes. Add chopped almonds or pecans for texture if desired. Don’t want to use dried cherries? You can use cranberries in place of cherries. You can also add 1/2 cup of chocolate chips to your batter if you want extra chocolate-y goodness. Store biscotti in an airtight container, preferably a tin, which helps keep them crisp. Place parchment paper or waxed paper between layers of cookies to protect the chocolate and icing. Stored properly, these biscotti will last up to 2 weeks. Biscotti are intended to be hard or slightly crunchy when bitten in to, but not rock hard. Biscotti means ‘twice-baked’ meaning you have to bake the cookies twice so they turn out dry and crunchy. 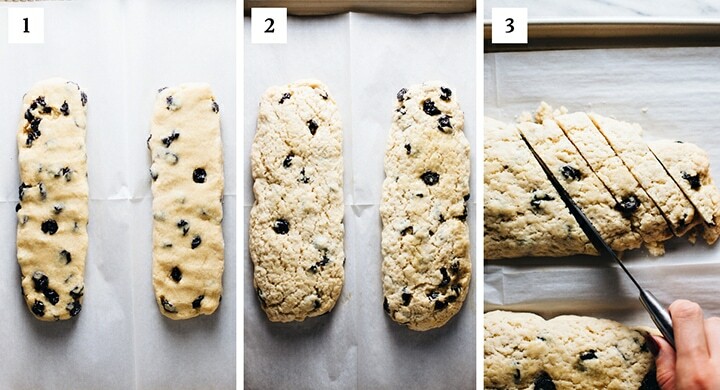 Yes, Biscotti does freeze well. 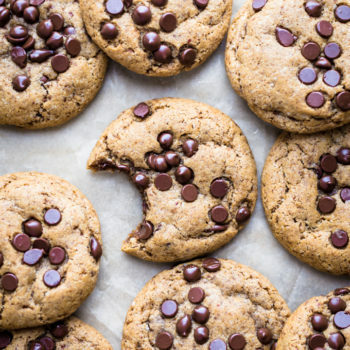 Bake properly and let them completely cool before placing in an airtight container or ziplock bag to freeze. 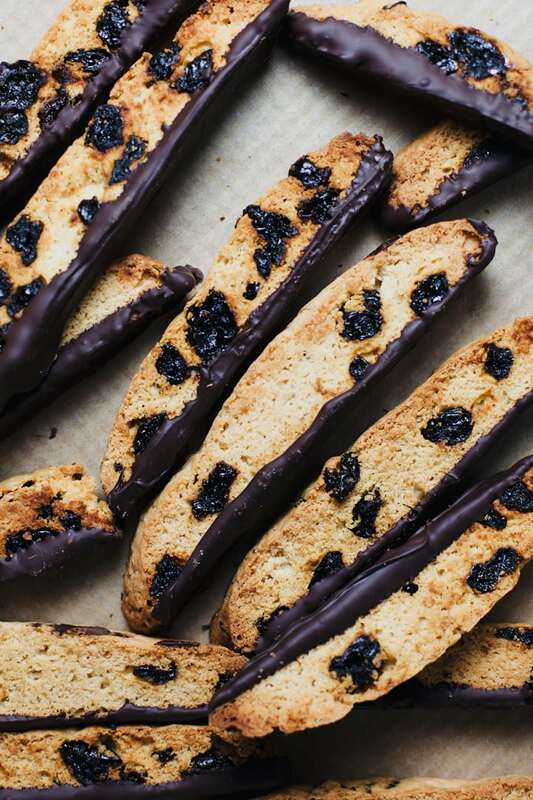 Delicious Italian Biscotti with dried cherries and dark chocolate. This recipe will turn you into a biscotti lover - irresistible cookies that are slightly crunchy, perfect for coffee dunking, and are so yummy! In a small bowl: stir flour, baking powder, sugar, and salt. In an electric mixer or separate bowl: mix butter, vanilla, and eggs. Slowly add flour mixture into wet ingredients. Then, slowly stir in dried cherries. Separate dough in half - lay on the parchment paper lined cookie sheet and form into two 9 1/2" x 2" logs, about 3/4-inch tall. Use a wet rubber spatula to easily form dough. Bake logs for 25 minutes then let cool for 10 minutes. Lower oven to 325F. Slice logs diagonally into 1-inch biscotti cookies then lay them back on the sheet pan and bake for 25 minutes at 325F. Remove from oven and let cool completely. In a shallow, wide bowl melt chocolate by heating in microwave for 30 seconds at a time, stirring each time, to avoid burning. Repeat until chocolate is melted. Dip bottom of biscotti in chocolate then lay on parchment paper sheet pan - when all pieces are dipped in chocolate, refrigerator for 15 minutes until chocolate is hardened. Serve with coffee and enjoy! Don't want to use dried cherries? You can use cranberries in place of cherries. How long do homemade Biscotti's last? Biscotti are intended to be hard or slightly crunchy when bitten in to, but not rock hard. 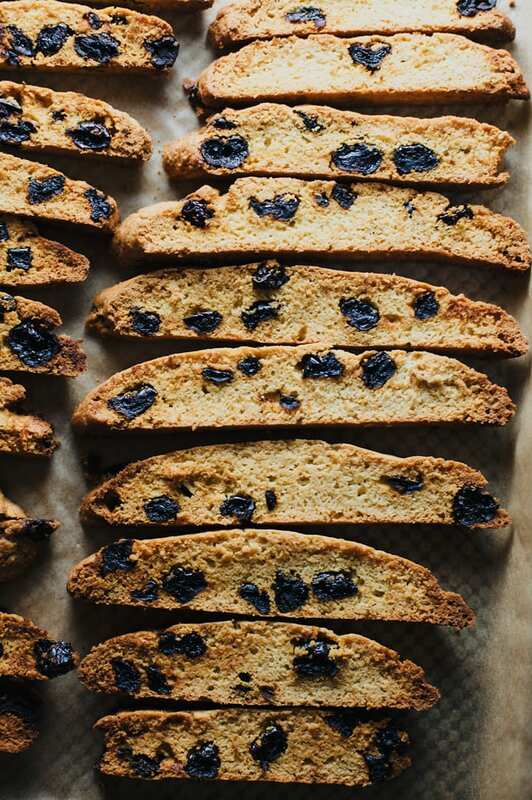 Biscotti means 'twice-baked' meaning you have to bake the cookies twice so they turn out dry and crunchy. This looks ridiculously amazing. Save one for me!